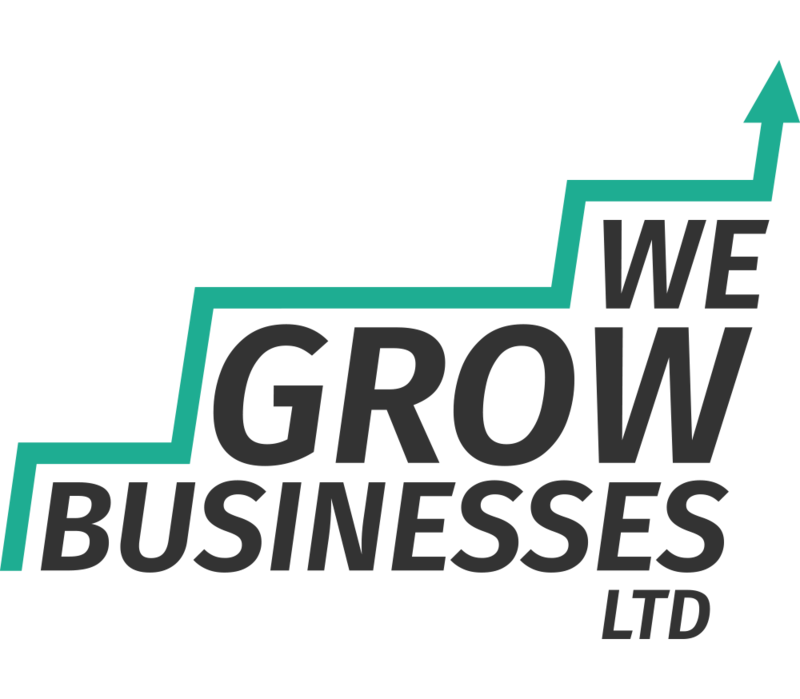 Business Prioritisation Made Simple | We Grow Businesses Ltd.
At Hooke & Co. Business Strategy we use a business prioritisation tool called a weighted prioritisation matrix to make sense of complex situations. Here’s how it works. We use this tool because it allows us to make sense of complex situations where there are lots of different options to consider, and lots of different factors to take into account. In this article we’re going to give you a quick and simple way to do business prioritisation. It’s not as thorough as our weighted prioritisation matrix, but it’s definitely a lot better than gut feel! Begin the business prioritisation process by spending a few minutes thinking about what is important to your decision-making. For example, say you wanted to run a little marketing campaign. It’s probably going to be important that the campaign creates some sales. We’re busy people, so it needs to be quick. Ideally it should be seen by lots of people. And we don’t have money to waste, so we need it to be cheap. Perhaps you could brainstorm this, just like we’ve done in the following picture. Finally, put the things that are important to you (your criteria) in order of importance, just like we’ve done on the right hand side of the picture. This step in the business prioritisation process is pretty self-explanatory – brainstorm your different options. 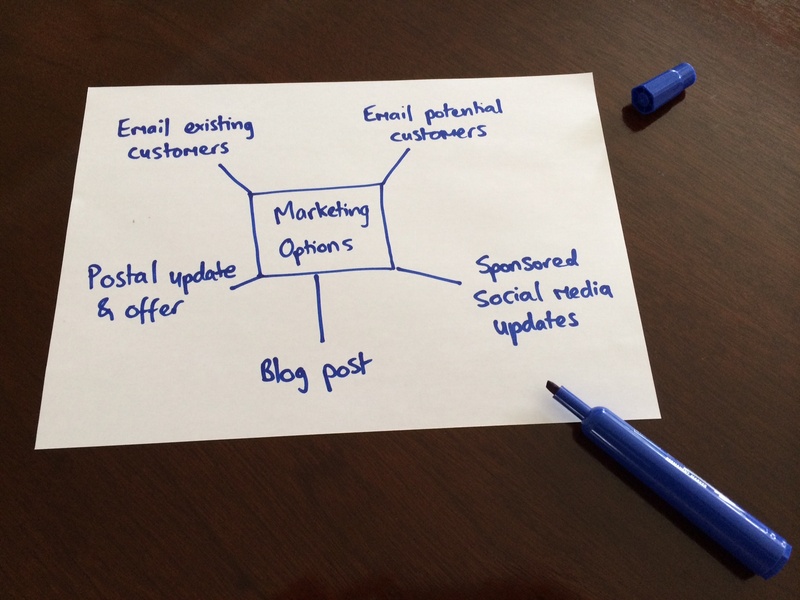 In the picture we’ve brainstormed some different marketing options. 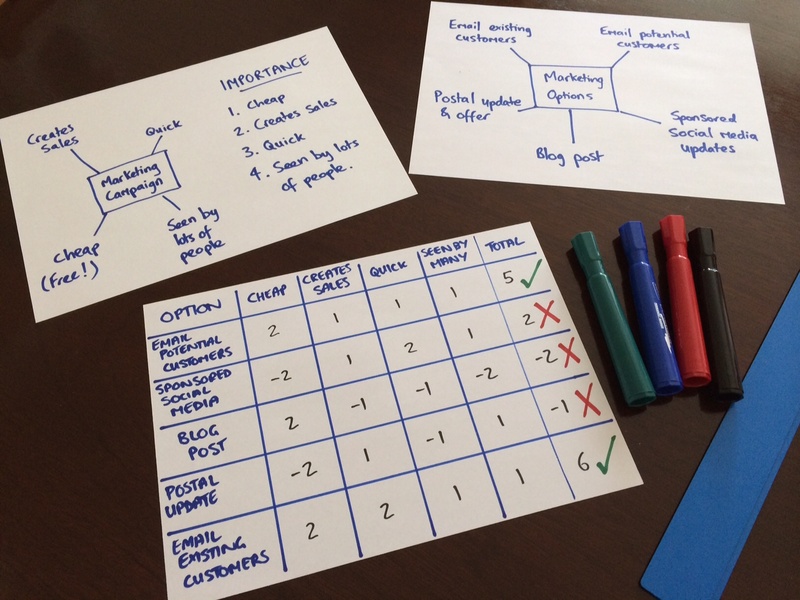 Have a look at the following picture – we’re going to create a simple business prioritisation table. In the first column list the options from Step 2. Create some more columns. Across the top row add your criteria from Step 1. Put your most important criteria on the left (e.g. cheap), and your least important criteria on the right (e.g. seen by many). Finally, add a column on the right to total up your business prioritisation scores. Now we need to score each option against each criteria. On the right is a simple scoring system. Start in the top-left of the table, and put a score in every box. 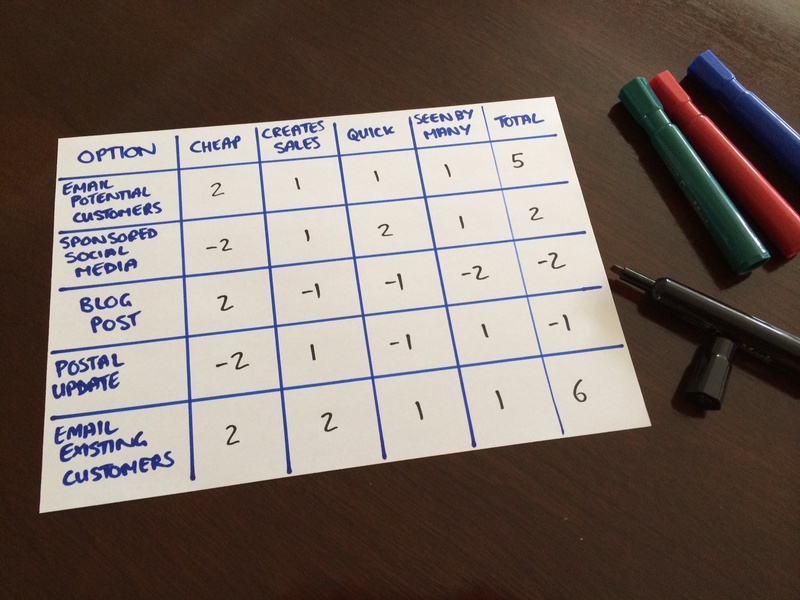 Finally, add up the business prioritisation scores for each option, and put the total in the “Total” column. Obviously the higher the score, the better the option. In this example, emailing existing customers and emailing potential customers come out as the best two options from the business prioritisation exercise. Arguably, you’ve done the easy bit. The hard part is now working in accordance with the results of your business prioritisation. You need to discipline yourself, and possibly your team. You need to monitor and control to ensure things stay on track. There’s always the temptation for people to spend time on the things they like doing, rather than the things the business prioritisation says they should be doing! In this article we’ve given you a simple business prioritisation approach. We recommend you firstly work out what’s important, list your options, score your options and finally apply the business prioritisation results. Sometimes using gut feel for business prioritisation can work out well. However, there are times when it goes badly wrong. It’s a risk. 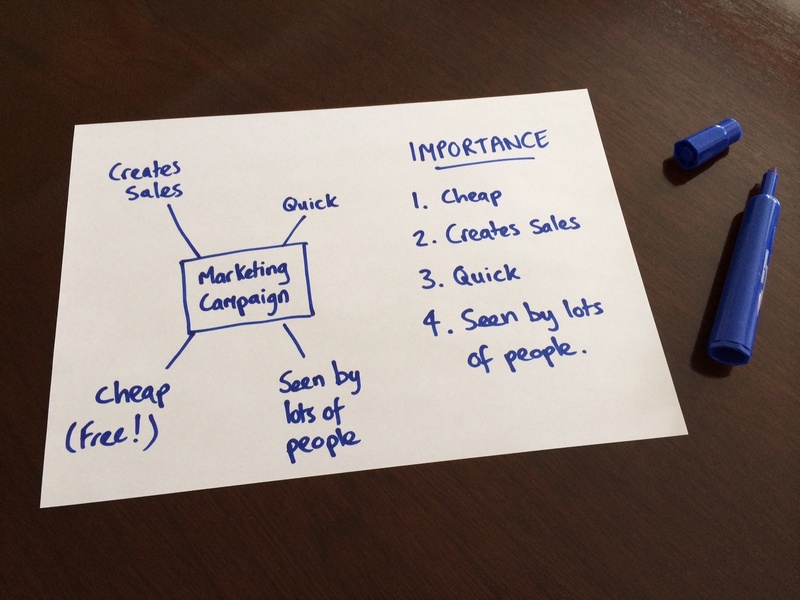 A simple business prioritisation approach like this only takes a few minutes. A tiny bit of time spent on business prioritisation can help to avoid some expensive mistakes and avoid missing more profitable opportunities. We hope this simple business prioritisation approach helps.